This single muffle Kori cremation furnace suddenly appeared in the Monowitz. camp [Drawing 5] in the summer of 1944 (according to the recollection of Mr Jacques Zylbermine) and was stored, raised off the ground by wooden beams, in the eastern or southeastern part of the assembly ground for three or four months until November 1944. when it disappeared as suddenly as it had appeared. Transported to AL Trzebinia, it was permanently installed in a small brick building, 7.30 m long, 3.15 m wide and 2,50 m high, with a corrugated iron roof from which a chimney projected to a height of 4,80 m [Photos 6 and 7 and Drawing 12]. 50 cm in front of the muffle door, there was a frame carrying two rollers to support a corpse charging stretcher of the type used in the four Birkenau Krematorien. The cylindrical fuel oil task was mounted just above the furnace casing to one side [Photos 8, 9 and 10] and the oil was pulverised in two burners (upper and lower) [Photo 11 and Drawing 12] driven by air from a blower situated at the top of the furnace on the other aide [Photos 7, 8 and 9]. The main (upper) burner was used to incinerate the corpses, while the secondary (lower) one [Photo 11] was used al a later stage to complete the incineration of the albuminous parts (not so easy to burn) that fell through the transverse supports [not shown on Drawing 12]. The burners were manufactured by Messrs Kubitz of Berlin who supplied these specialized items to Kori. After the prisoners had been evacuated in the evening of 17th or 18th January 1945, the police or the local militia blew up the cremation furnace by introducing two hand grenades into the combustion chamber and closing the doors. The explosion destroyed only the front of the furnace [Photos 7, 8 and 9], blowing the front plate completely out. The main burner at the rear was also blown out by the blast [Photo 11]. No human bones were found in or around the furnace, which raises the question of whether it was in fact ever used at this late date. Whether it received enough fuel oil to effect the fifty or so cremations claimed, or whether because of lack of fuel the SS continued to send the dead to Birkenau Krematorium V are questions that cannot be answered at this stage. If the furnaces was used, there is no question of talking about its cremation performance, which could be estimated at one corpse a day, for it would never have operated continuously, its role being strictly sanitary, nothing whatever to do with mass extermination. Somewhere between 1970 and 1975, the Trzebinia furnace was transported to the Auschwitz museum and installed in the “laying out room” of Krematorium l, where visitors can see it today and reflect on the fact that either it was never used, or it reduced to ashes a maximum of fifty unfortunate Jewish slave laborers. 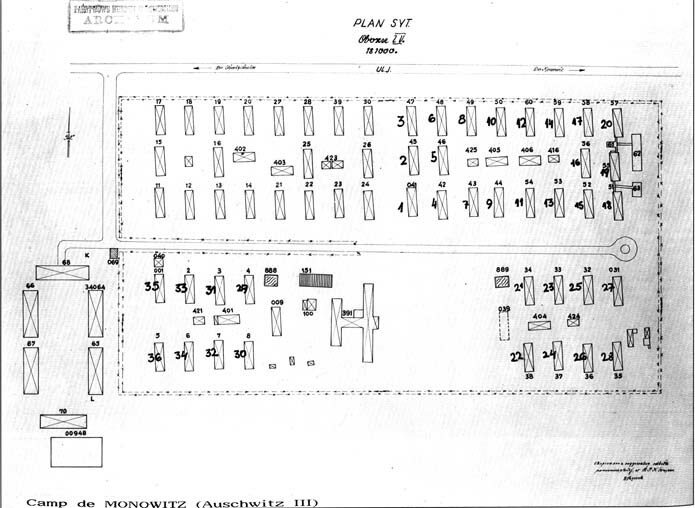 Polish drawing of the Monowitz camp (Auschwitz III), scale 1:1000, a copy based on German originals. Its title “Obozu IV/Camp IV”, refers to the civilian designation used by IG Farben (the firm who financed the camp), who numbered from I to IV the various camps (housing civilian workers, such as those sent under the Vichy France compulsory labor scheme. British prisoners of war, and other prisoners) located on a strip of land bordering the industrial complex to the south. The assembly ground where the Kori mobile furnace was temporarily stored is the space to the right of the cookhouse (building 391, in the form of an “H").